The most useful of the Ordnance Survey (O.S.) maps for the fisherman is the Landranger series, scale 1:50,000. For each of the lochs and rivers listed in these pages, I have given the relevant O.S. Map number. In addition to the information provided on this website, I would recommend that anyone planning a fishing or walking trip in Scotland should equip themselves with a compass and the appropriate Ordnance Survey map. The map below shows the areas of Scotland covered by the various O.S. 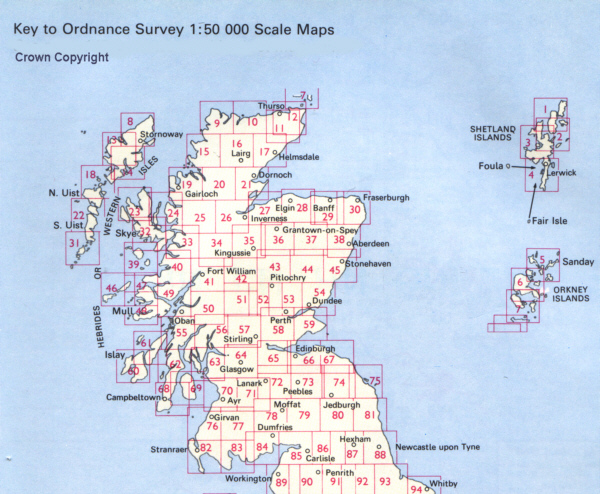 Maps and the map numbers of the relevant Landranger Map, as published by the Ordnance Survey. See also Maps of Scotland for detailed reduced survey maps covering the whole of Scotland, relating particularly to the fishing lochs and rivers of Scotland. Reduced ordnance survey maps, on a scale of half inch to one mile, were produced throughout the twentieth century by John Bartholomew & Son of Edinburgh. 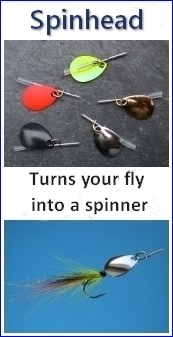 They were very popular for those engaging in outdoor recreational pursuits such as cycling, touring, walking and fishing. The Ordnance Survey Landranger map series, scale 1:50,000 (2cm to 1km or 1 1/4 inches to 1 mile), covers Great Britain in 204 sheets and is suitable for detailed exploring by car or on foot. Rights of way and over 100 types of topographical detail are shown, including viewpoints, footpaths, streams, woods, crags, contours, stately homes, parking places, bus and coach stations, camping and caravan sites and ancient monuments and buildings. Ordnance Survey maps enable users to find or give the location of places by means of the Grid Reference System, which is explained on each map.